CORBA's 22nd Annual Fat Tire Fest and Fundraiser is Sunday October 25th at Castaic Lake State Recreation Area - Special Guest Pro Brian Lopes! The CORBA 22nd Annual Fat Tire Fest and Fundraiser is proud to announce the attendance of a very special guest pro, four time Mountain Bike World Champion, honored member of the Mountain Bike Hall of Fame and BMX Hall of Fame, Brian Lopes! USA Today calls him "Undisputedly the best all around world class cycling athlete." Come out! Meet and ride with Brian! Join Brian for an advanced ride in Grasshopper Canyon! He will demonstrate some of his techniques and have his book "Mastering Mountain Bike Skills" to autograph and posters to sign. Pre-Register for the FTF Today! You can get your registration name plate, lunch ticket, goody bag and raffle tickets faster, and get out on the trails and start riding sooner by pre-registering on line. It's easy to register!! Just go to one of these links and SIGN UP now! The Fat Tire Fest is also proud to present members of the Subaru-Gary Fisher Regional Team headed by manager Alex Boone who will be leading intermediate and advanced rides with participants in Grasshopper Canyon and assisting the Skills Clinic. We will also be joined by special guest riders from the SoCal Interscholastic Cycling League who will also be accompanying riders on the intermediate ride for participants. The Fat Tire Fest welcomes all the 2009 exhibitors, sponsors and donors! We have in addition to all the g reat exhibitors, generous donors and sponsors already posted on our web site, we now have joining us - Ergon USA and great prizes from Rocky Mountain Bicycles! We also have 2010 Demo Bikes from Ibis, Scott, Giant - both road and mountain, Specialized, Trek and Trek Women Specific bikes, and Cannondale! 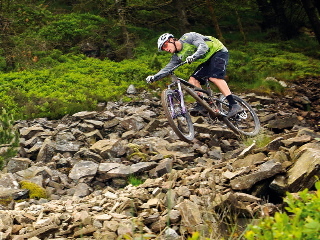 Check out all our prizes you could win on the FTF web site and the latest prize from Trek - a Skye SL mountain bike! WIN MOVIE TICKETS! 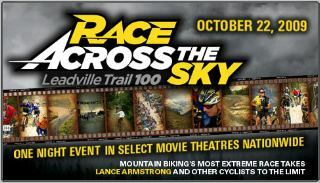 We still have some movie tickets available for "Race Across the Sky- Leadville 100 Trail" movie premier, featuring Lance Armstrong, on October 22 donated by Citizen Pictures and Fathom. To win tickets you must register for the Fat Tire Fest on PayPal and also join as a NEW member of CORBA! NEW FTF EVENT! This year we will have an added feature - Girl Meets Bike- Cycling Fashion Show at 12:30 in the main staging area! Come check out the latest sartorial cycling garb so you'll be styling while you're riding! NEW! Bring Your Best Shot FTF Photo Gallery! Bring your greatest mountain bike photo to the Fat Tire Fest and post it on the FTF Gallery board in the main exhibit area! Photos not to exceed 8 X 10. Post your photo and win an IMBA cap or wool socks while supplies last. For all CORBA Fat Tire Fest 2009 events, schedule, directions, registration and prizes and all Fest details go to: www.corbamtb.com or www.fattirefest.com! Stay tuned for more Fat Tire Fest news!